“Hon, don’t forget we have that children’s show tonight!” My husband and I don’t exactly dread shows and activities for our three- and four-year-old daughters, but let’s face it – Friday night plans aren’t what they used to be pre-children. So when we headed for Richard Scarry’s Busytown, showing at Virginia Rep’s Children’s Theatre of Virginia at Willow Lawn (a first for our family), no one knew what to expect. The excitement began to build as my girls spied the giant poster bearing the familiar illustrations from a beloved book in our home, read many, many times over – with a spine thrice repaired to prove it. After we were seated, I found myself in my usual position, focused on my girls’ faces rather than on the show. It’s their enjoyment of such events that make it fun for me. At least that’s usually the case. “Look, it’s Sergeant Murphy, and there’s Lowly Worm, and the Busytown post office!” said the grownup – not the small children in the party. 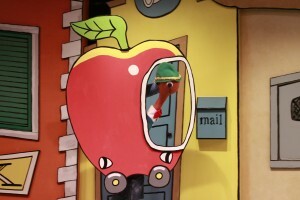 It was instantly obvious this would be a show for all ages, just as Richard Scarry’s books (first published in the fifties) are loved by multiple generations. Even before the performers took the stage, the whimsical set, designed by Chase Kniffen, associate artistic director at Virginia Rep, transports you to favorite Busytown spots. There’s even a giant pickle car. Under the direction of Jan Guarino (who also brings Betsy Bear to life), the show features costumes and hand-made puppets by local artisan and designer, Lynn West. As the two-act play unfolds you meet Huckle Cat, played by Dan Cimo, as he becomes familiar with the day-to-day affairs of Busytown, eager to make friends. Sergeant Murphy struggles to keep Busytown crime-free in spite of a banana larceny incident. Lowly Worm has a close call that lands him in the hospital–but have no fear, here’s Nurse Nellie to the rescue! If only she can work through her own heart skipping a beat with undying love for Lowly. In a highly memorable segment, Allison Gillman’s Train the Dog won the crowd over, inviting audience participation. Betsy Bear shines as party planner extraordinaire. Grandma Bear won’t soon forget this birthday celebration that’s for sure, thanks to the citizens of Busytown, especially Huckle and his tireless efforts to produce the perfect birthday cake. 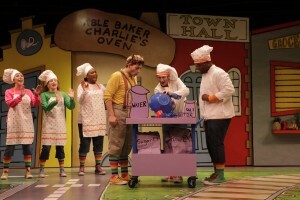 It was the familiar and family favorite Busytown that brought us to the Children’s Theatre of Virginia Rep for the first time, but the incredible talent offered by this six-member cast, will have us coming back for more productions. Now to explain to my three-year old that Busytown isn’t really just a twenty-minute trip from home and a place that we can visit at will. 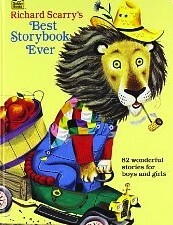 Perhaps I’ll ask Betsy Bear to handle that one! 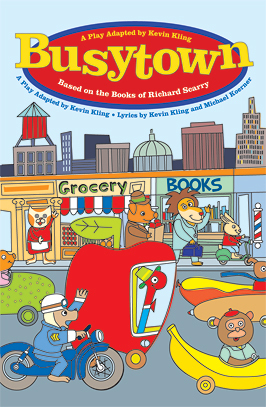 Busytown runs through July 28. The show is about an hour and ten minutes and just right for children three years and up, with plenty of humor to entertain older kids and adults. Virginia Rep is offering Busytown donuts from Dixie Donuts as a special treat before and after the show. Visit Virginia Repertory Theatre for ticket information and showtimes.